An ever-growing number of toy awards are announced each year to celebrate the best new products on the market. Magazines such as Mother & Baby, Practical Parenting and Baby & Pregnancy all run their own awards - and it's worth keeping an eye out for the TOTY Awards if you're interested in knowing what toys are proving popular over the pond. 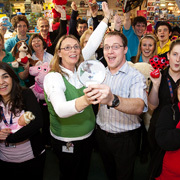 This prestigious annual award takes place at Toy Fair each January. This hotly contested award is announced at the Gala Dinner on the opening night of London's Toy Fair. The Toy Retailer of Year is always one of the most hotly contested awards at Toy Fair's lavish Gala Dinner. As well as awards for retailers and suppliers, there is also a prize for the toy personality of the year presented on the opening night of Toy Fair. This award is to give recognition to those individuals who have given a special or long service to the toy industry. This award recognises and honours people for their outstanding achievements during their working life within the toy industry. Sponsored by the Nursery Today trade magazine, the BANTA awards were created to reward excellence within the nursery industry. The rebranded Good Toy Guide forms part of Dr. Amanda Gummer's play advice website known as My Two Front Teeth. This annual event is where the top toy predictions for Christmas are announced. Designed to reward excellence in educational and childcare products, this is one of the longest running awards of its kind. Created by the team behind the Let Toys Be Toys campaign, Toymark awards toy retailers who refuse to display gender signage in their stores. In addition to the awards outlined above, it's also worth noting that from July each year, many High Street retailers publish their predictions of what they think will be the top toys for Christmas. These lists however, are more based around their own buying selections, rather than taking a more overall view of the toy business.